The world roared in laughter and amazement to learn that the Rock fell to a Spanish Army which, unaided by the French or cards, and with the added penalty of a supporting English fleet offshore, rolled back-to-back boxcars to successfully reclaim the strongest fortress in Europe for the Spanish Bourbons. Of course, it took a kid to do it. A.J. Sudy, the youngest player at this year’s Waterloo mini-con, blessed with the luck of youth took Gibraltar in a stunning blow that only served to cap his already magnificent play. 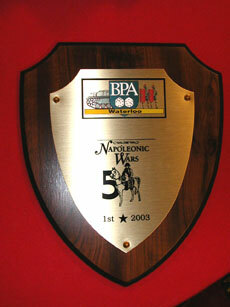 A veteran of many tournaments and games of Napoleonic Wars despite his tender years, A.J. not only went on to win that game, but with his capture of Gibraltar also gained the award for “Best French” winning his game with an amazing 11 victory points. That the was the most scored by ANY player in ANY round as ANY power in the convention. A.J. 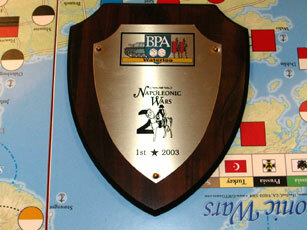 had a lot of competition for the “Best French" award, as the French won nine of the 17 multi-player games played. Going into the last round, John Emery was the favored “Best French” with a 9-VP win. French luck was so strong in this tournament that even the designer, whose record for disasters is arguably unparalleled in Napoleonic Wars history, had won games as the French in Rounds 2 and 3 and in one of those games not only forced England to submit on one turn, but two turns later invaded again, and flagged every single duchy in the British Isles. Yet, still, this could not compete with A.J. and his magnificent, nay, “Napoleonic” victory. A.J. Sudy’s stunning play and overwhelming victory was enough to gain him the coveted “Best French trophy along with a miniature bottle of Napoleon brandy that will, like the player, need age a few years before it can be consumed by him but it was not enough to win the tournament. That honor fell to, or rather was seized by, Dr. Mark Hodgkinson, a chemist in the oil industry who timed his vacation to the United States to be able to play in the tournament. Mark won the tournament by winning three of his four rounds. The leader by one point going into the final round, he nearly succumbed to the brilliant and seemingly overwhelming play of Melvin Casselbery’s French, only to turn the tables at the very end of the third turn by landing Wellington in Prussia, defeating two Prussian armies and conquering that French ally—played by the designer himself, whose brilliant luck of Rounds 2 and 3 as France had helped him lead the Prussians to destroy a Russian Army Group, retake Warsaw and Konigsberg and seize Grodno. All of which added to the brief and transient glory of a Prussia who but for the presence of a French army but ONE more duchy to the east would not have been left to defend its back door alone against the Iron Duke. Mark Hodgkinson’s previous games were also hard-fought. In Round 1 he gained a 4-VP win as France in a one-turn game that ended with his peace roll of a “6". A roll that the designer, as Austria and only 2 VP behind, had burned a card to prevent (and which would have been negated altogether had either Joseph Ward as Russia, Steven Jansen as Prussia or Kevin Sudy as Britain, all of whom had 1 or 2 VPs emulated). In Round 2 Hodgkinson won a difficult game as Russia, holding on for four turns to wrest victory not, surprisingly, from Kevin Sudy’s French but from Fred Schachter’s Prussia ... a victory sealed ... or some say stolen by, appropriately, Poniatowski and his Poles. Fred’s 2nd place finish and 3 VP score earned him the “Best Prussia wood. Dr. Hodgkinson’s third game was nearly his undoing. His Austria came in third with zero points behind John Emery’s 2nd place Russia (1 VP) and John Wetherell’s victorious France (3 VP). That the game was close is shown by the score, as Francis Czawlytko’s fourth-place Britain was only down by a negative 1 VP. in the lead for the British crown. Fred Schachter, who won the “Best Prussia” trophy for the game with Hodgkinson noted above, also won the “Best Austria” for his 4-VP win. Keith Wixson earned the “Best Russia” honors for his 4-VP Russian win. Of the 17 games played, France won nine; four of them by big margins (7, 7, 9 and 11 VP). Six of the other eight games were split by Britain and Russia, and two went to the Austrians. The Prussians gained a pair of second places but had few chances as the 4-player game predominated over the 5-player version throughout due to the numbers of players on hand. Even so, Fred as Prussian nearly won his game, and would have done so but for the need to burn his resource to put down the Polish revolt. Several pick-up games were also played, mostly by gamers in between rounds of the two-player competition joining with those whose multiplayer games had ended early. Wellington, the GMT game using the same system as Napoleonic Wars, was set up for demonstration and tournament play on the side. Two games were played, and trophies (hand-painted 25mm mounted generals on wooden stands) were given to Steve Jansen for England, Joe Woolschleger as the French and Ed Kendrick as the Spanish. Ed also won the overall award, a figure of Wellington himself. Two demonstration games of Kutuzov, the third game in the series (and which is currently on the GMT p500 list) were also played. 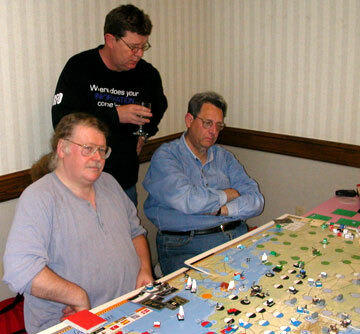 Both Wellington and Kutuzov were designed by Mark McLaughlin, who designed Napoleonic Wars, and both were developed by Fred Schachter, who taught eight of the gamers how to play Kutuzov in between tournament rounds. This third Waterloo commenced, as did the other two, with a toast made with Courvoisier or Perrier, for those who do not imbibe to the man without whom this game would not have been possible: Napoleon. In addition to the “Vive L’Empereur toast, however, participants were asked to drink a second toast in remembrance of the Battle of Trafalgar, the 200th anniversary of which occurred the Friday before the tournament. The toast was to “Remember Admiral Nelson and go sink something French! Tournament victory points are based on the total of four rounds of play, with 7 points awarded for a first, 5 for a second, 4 for a third, 3 for a fourth and 2 for a fifth. Ties were broken in favor of most wins—and those ties were broken by the side won with (a Russian win is worth more than a French win, etc). If still tied, VPs in each win were considered. Sixth place laurels were very tightly contested with AJ winning a three-way tiebreaker with Kieth Wixson and Rich Shipley—all of whom had 20 points. The Two-Player tournament bounced back with 14 players participating—many of them double dipping between the two- and five-player versions as long as time and schedules would permit with the decision to concentrate on one or the other postponed until the final round or one’s fortunes made the decision for them. The most notable event was John Emery’s defeat in the first round by Scott Moll. It represented the first time that the two-time, two-player champ had tasted defeat in three years of Waterloo. Properly chastized, John retreated to the safety of the five-player game for the duration of the weekend where his Best France designs with a 9-VP win were squashed when the Spaniards took Gibraltar to give AJ an 11-point win. Schedules of convenience and unpredictable game lengths played havoc with the pairings again as expected so some players played as many as seven games while others had to scramble to get four. Several others dipped their toes into the two-player event but once—thus providing an opponent for someone else but no actual chance to win the event themselves. This made it difficult to fairly administer pairings and tie breakers but is a generally accepted concession to running multiple events in the same venue while maximizing players opportunity to play in a game with such major variations in playing time with both one-turn games and marathon sessions in evidence. Nonetheless, the title came down to the fourth round with five players still alive at 2-1 and four of them with a shot at the overall title based on tie breakers. Ken Gutermuth and Scott Moll both took quick strike concessions over Henry Russell and Rob Beyma respectively to claim all the honors. Scott won his blitzkrieg with the French as Davout routed Ferdinand in Linz and marched into Vienna on the opening Impulse. When the British lost two Squadrons to no Imperial losses despite a 19-5 advantage while refighting Trafalgar, Rob’s morale was broken. Meanwhile, the french luck for the round was evening out in the other game as Ken’s allies reversed the tides of war against Henry Russell’s French with similar speed. Both Gutermuth and Moll finished 3-1, as did Ken Richards, but Gutermuth won on a strength of schedule tie breaker with six defeated opponent’s victories to Moll’s four and Richards’ two. Not surprisingly, the two leaders also ran off with best side wood as Gutermuth claimed best Coalition at 3-0 while Moll went unbeaten with the French in three tries. Sadly, once again, the top two players never faced off which is the problem with a four-round format. A fifth round is needed but is not practical given the double dipping that takes place between the two tournaments. Ken lost his lone game as the French in a four-turn marathon with Rob Beyma. Ken missed a pair of 33% Victory rolls and narrowly missed a third try on Turn 3 as Rob wrested the victory roll away with a last impulse gain. The Coalition at that point assumed control and won in four turns. Scott’s lone loss came in a three-player game with Scott Fenn and Don Greenwood. Moll’s Russians were done in when his last card—Extended Campaign—was stolen by the French. Scott Fenn then brought the Turks into play to turn the Austrian flank and when Don Greenwood’s Brits uncharacteristically refused to give Parliament away, the French took a one-turn win. In a reversal of fortune of years past, the Coalition claimed 14 of the 21 games played. Sadly, this may have been the last Waterloo mini-con. Rising costs and declining attendance may spell the end of the series. Thanks to all who supported it. I hope you enjoyed it.